Hello and happy Wednesday! Hope your week is going well, its actually been warm and summer like this week which I have been LOVING! Summer if my favorite season after all so I'm happy about that! 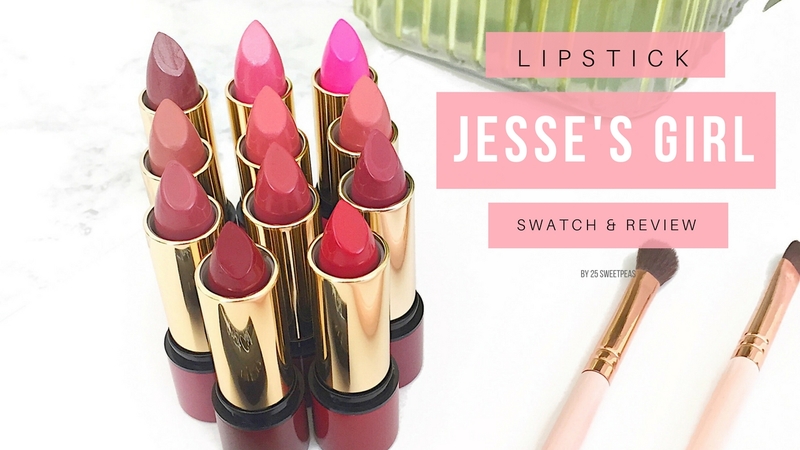 :) Today I am sharing some swatches and photos of some lipsticks that Jesse's Girl sent over for me to try. I have loved their polish that they have done with Juli G and I will go ahead and say I also like their lipstick! So lets go! First off the packaging is really nice as you could see in the first photo! It feels like a quality base with a nice light weight lid that clicks on nicely so its not just going to fall off in your purse which is really nice. I don't know about you but for me my purse is basically a lipstick holder lol! I am always grabbing whatever lipstick is in my purse to put on in the car. I feel like I rarely put on a lipstick in my bathroom, lol! Its always a car thing for me so having lipstick in my purse is pretty important! These all have nice formulas. Out of the 11 there are 2 that have slight shimmer. Those 2 are the only ones that don't show that well. The rest are quite pigmented and look nice on. You guys will see that in todays video too! Ok now let the swatches begin! All of the ones in the above photo are creme finishes. You can see the names on the bottles lined up on the side! :) One of them was missing a label on the bottom but had the number on the side and after looking it up online I learned that one is named Ventura. Below is a list from top to bottom. The top two in this phot are the ones that have a slight shimmer running throughout them. Its very faint and not too noticeable on the lips. All of these are currently available on the Jesses Girl website HERE and they are about $5 each which is really reasonable I think for such a nice lipstick! Lol I feel you about purses being lipstick holders... I have 4 in mine right now! These remind me of the Burt's Bees lipsticks a little bit. The colors are so nice and I love a creamy finish. I really like Ventura and Georgia. $5 is such a good deal, too. Right, I won't say how many LOL I 'm pretty sure its about 6 lol!! I could see that colorize, I haven't used those yet. Was looking for them just the other day to see if there were similar colors! Those are 2 of my faves too! yesss! That one is amazing!!! There are so,so many colors I like! They are all so wearable! We might as well call them lipstick bags instead of handbags right?! Loved the swatch video chat. These are beautiful swatches. Yay, so glad! Thank you so much! Your swatches are great. I see so many that I could wear. I'll see if the Rite Aid near me has them. Right?! They really are all wearable! Hope they do! Haha I have like 15 lipsticks in my purse right now...also Georgia looks like my perfect spring shade. I will have to check it out!! Who's counting right!? Its a lippie bag! LOL! You must that one is perfect! These shades are all gorgeous and easy to wear. Exactly, probably why I love them so much and gravitate to these colors in every brand! These are all so wearable! Looking forward to more makeup posts from you. They really are! Thank you, I am excited to do more! LOVING your swatches so much! yay, thank you so so much! Your picture set up is so lovely! And I really like all these shades, so pretty. You did such great swatches! I love your swatches! I've been using these and I can't pick a favorite! They're just so pretty.